Braintree periodontist Dr. Thomas Mone is performing a new kind of gum disease treatment in the Boston area with the Laser Assisted New Attachment Procedure (LANAP), a gentle gum surgery alternative that removes gum disease, stimulates bone growth and can possible save teeth. Dr. Mone is one of few periodontists in the region to offer LANAP. 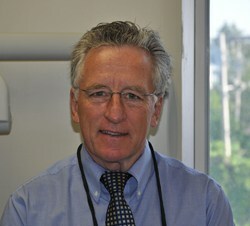 Dr. Thomas Mone Offers Gum Disease Treatment Using Laser Gum Surgery. Patients who need gum disease treatment in the Boston region can now choose the Laser Assisted New Attachment Procedure (LANAP), a cutting-edge gum surgery alternative with Dr. Thomas Mone. LANAP® is a safe, FDA-cleared gum surgery alternative that is gentler than conventional scalpel treatment. Backed by human histological studies, LANAP® can even stop tooth and bone loss, two of the most common consequences of untreated gum disease. Periodontal disease strikes about 75 percent of the population, yet only a fraction seek treatment because of the discomfort and inconvenience associated with conventional scalpel surgery. Without treatment, medical research shows gum disease can lead to cancer, heart disease and other serious illness in the body. Dr. Mone performs LANAP® using the FDA-cleared PerioLase® MVP-7™ laser. It is engineered to provide a gum surgery alternative that is exponentially more precise and less damaging to gum tissue than a typical gum disease treatment in Boston. The laser is designed to isolate and kill only bacteria and diseased tissue, so it goes straight to the source of the problem, removes it, and leaves the good tissue intact. The remaining tissue is now able to reattach to the patient’s tooth root surfaces and resume its job of protecting teeth. A laser gum surgery alternative with Dr. Mone can even cause new bone growth around existing teeth. For the first time ever, patients seeking gum disease treatment in the Boston area have a better chance of keeping their own teeth. LANAP® is today’s gum surgery alternative to scalpel surgery. A greater awareness of LANAP® gum disease treatment in the Boston area with Dr. Mone will hopefully encourage more people to get the dental care they need but are too afraid to get. To learn more about this revolutionary gum surgery alternative, please call or visit his website at http://www.braintreeperio.com. Mone Periodontics is a periodontal practice offering personalized dental care for patients in Braintree, MA. The leading periodontist at the practice, Dr. Thomas Mone, graduated from the University of Massachusetts with a bachelor’s degree, and then went on to attend the University Of Pennsylvania School Of Dental Medicine and graduated at the top of his class. He completed his periodontal training at Boston University Goldman School of Graduate Dentistry. Dr. Mone is part of one percent of dental professionals providing the only FDA cleared laser procedure for gum disease and periodontal treatment. To learn more about Mone Periodontics and their dental services visit their website at http://www.braintreeperio.com and call (781) 348-9925.